Considered by the specialist music press as one of the most important cellists of his generation, Asier Polo has worked with many of the major international orchestras, such as the Philharmonia Orchestra, London Symphony Orchestra, Danish National Symphony Orchestra, Orchestra Sinfonica Nazionalle della RAI, Dresdner Philharmonie, Orchestre de Paris, BBC Philharmonic, Bergen Filharmoniske Orkester, Israel Philharmonic Orchestra, Berliner Symphoniker, Orquesta Nacional de México, Orquesta Sinfónica de Sao Paulo, Louisiana Philharmonic, Spanish National Orchestra and the Basel Symphony Orchestra, under the baton of distinguished conductors such as John Axelrod, Pinchas Steinberg, Christian Badea, Rafael Frühbeck de Burgos, Claus Peter Flor, Carlos Miguel Prieto, Günther Herbig, Juanjo Mena, Antoni Wit and Anne Manson. He has appeared with great artists such as Silvia Marcovici, Nicolás Chumachenco, Sol Ga­betta, Maxim Rysanov, Isabelle van Keulen, Josep Colom, Eldar Nebolsin, Gerard Caussé, Cuarteto Janácek, Cuarte­to Casals and Alfredo Kraus, who in the last years of his career invited him to perform as soloist at his concerts, with engagements at the Maggio Musicale Fiorentino, Royal Opera House, Covent Garden in London, Tonhalle in Zurich and the prestigious Musikverein in Vienna, as well as a successful tour in the major concerts halls in Japan. He is devoted to contemporary music, especially from his native country. Always in demand to perform new compositions, he has a great interest in repertoire that is somewhat unknown by the general public (for example works by Tomás Marco and Carmelo Bernaola). 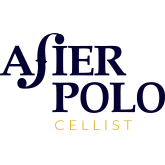 Composers such as Gabriel Erkoreka, Jesús Torres, Luis de Pablo, Jesús Villa-Rojo, Fernando Velázquez and Antón García Abril have all dedicated their cello concertos to Asier Polo. He enjoys combining modern music with the great classical repertoire, covering everything from Bach’s Suites, classical and romantic concertos, to contemporary music such as Dutilleux, Cristobal Halffter and Sofia Gubaidulina. He has recorded 17 albums for major record labels such as Naxos, Claves, RTVE, IBS Classical and Marco Polo, playing some of the major Spanish repertoire for cello, such as the concertos by Usandizaga, Rodrigo, Escudero, Marco, Bernaola and Rueda. Highlights include the nominated for the Gramophon Editor’s Choice Award CD dedicated to the work of the composer Sofía Gubaidulina (Et’cetera Records) and the recording of the “Ecos y Sombras” [Echoes and Shades] DVD dedicated to Cristóbal Halffter, performing his Cello Concerto Nº2 with the Spanish National Orchestra (Koala KPA 111), as well as Rachmaninov and C. Frank’s Sonatas with the pianist Marta Zabaleta and Brahms’ Cello Sonatas with the pianist Eldar Nebolsin. Two new albums will soon been released with the Spanish National Orchestra, conducted by Juanjo Mena: Joaquín Rodrigo’s two cello concertos, “Concierto como un Divertimento” and “Concierto in modo Galante”, as well as Alberto Ginastera’s second Cello Concerto, Op.50 (1980). Asier Polo has been awarded numerous prizes, and amongst others, the “Ojo Crítico” by Radio Nacional de España (2002) and the Fundación CEOE Prize for Musical Interpretation (2004). In 2009 he was appointed “Ilustre de Bilbao” (Bilbao being his native city). He is regularly invited to be on the judging panel of international cello competitions, such as the Dotzauer Wettbewerb (Germany), Carlos Prieto International Cello Competition (México), Benedetto Mazzacurati Competition (Italy) and the Manhattan International Music Competition (New York). He also gives masterclasses in many countries, including Germany, the Netherlands, Italy, Mexico, Venezuela and Brazil. Download press material, biography and high-resolution photos.